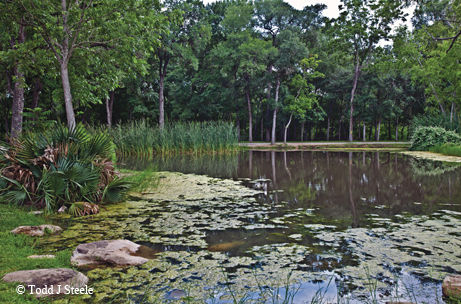 ﻿﻿﻿﻿﻿﻿﻿Palmetto State Park offers a nature-filled getaway in Central Texas. ﻿﻿﻿﻿Imagine a Texas swamp, fed by warm mineral springs and occasional river flooding, that provides a home to unique plant and animal life, some seen almost nowhere else in Texas. 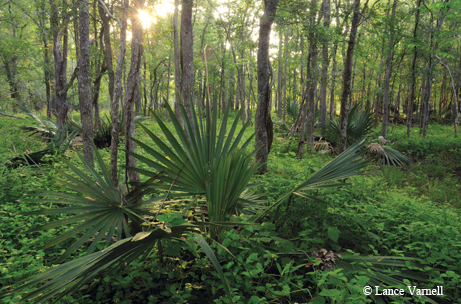 Back in the early 1930s, a small piece of that swamp near Gonzales became Palmetto State Park. Through the Civilian Conservation Corps’ efforts to blend nature into their construction, the park today looks almost as natural as it did eight decades ago. Just an hour from Austin or San Antonio and two hours from Houston, this picturesque park is a quick car ride for many Texans and easily accessible off of Interstate 10. If you’re looking for more than just a day trip, extend your retreat with a night of camping or a stay in the park’s quaint cabin. The first thing I look for at a park is a trail to hike or bike, and the winding, well-manicured trails at Palmetto State Park offer plenty to see. The Ottine Swamp Trail and Palmetto Interpretive Trail have boardwalks and bridges so you can wind through swamps filled with the park’s namesake dwarf palmettos. You’ll feel as if you’re in a tropical paradise. The San Marcos River Trail leads you along the high banks of the San Marcos River, where towering cottonwoods and sycamore trees stand guard. The Mesquite Flats Trail offers a look at the drier, savannah-like parts of the park, where prickly pear cactus finds a home. When you get finished exploring the park on land, enjoy the water. The always-fun Oxbow Lake offers calm water to cast a fishing line in search of catfish or sunfish. Try out a paddleboat, kayak or canoe, or take a swim in the cool water. The San Marcos River low-water crossing is a great place to either splash around in the water or take a tube for a 20- to 30-minute float around the park. Make sure you check river conditions with park staff. Didn’t bring gear? The park staff has you covered with rentals of life jackets, kayaks, canoes, tubes and hydro-cycles (basically bikes with pontoons). The park also participates in the tackle loaner program, allowing you to borrow fishing poles free of charge. The staff and volunteers at Palmetto State Park are eager to show you a safe and relaxing experience. Make sure you check in with them at park headquarters on your way in. While you’re there, pick up a souvenir at the well-stocked park store. Also, check out the park’s website or Facebook page for maps and more detailed, up-to-date information to help you enjoy your stay.